Listed below are the most popular Orlando sightseeing tours, shows, activities, attractions, transfers and passes. They were selected from the complete collection of tours and attractions that are available for this destination. These are the most popular, the best-sellers, the ones people purchase and enjoy time after time. For the complete list of activities for Orlando, click here. With two amazing theme parks – Universal Studios® and Universal's Islands of Adventure® – the non-stop nightlife of Universal CityWalk®, and three uniquely themed on-site hotels, Universal Orlando® Resort is an entire universe of action, thrills and excitement for every member of the family. Universal Orlando Resort is where vacation becomes adventure. Buy in advance and save! 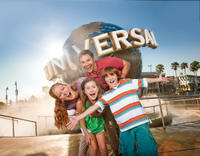 Universal Orlando® Resort lets you create the Ticket that's just right for you and your family. Buy as many days as you like, then add park to-park access for the utmost in flexibility. It's all up to U! With two amazing theme parks – Universal Studios and Universal's Islands of Adventure – the non-stop nightlife of Universal CityWalk, and three uniquely themed on-site hotels, Universal Orlando Resort is an entire universe of action, thrills and excitement for every member of the family. Universal Orlando Resort is where vacation becomes adventure. Take an unforgettable journey through remarkable islands where all your favorite myths, legends, comic books, cartoons and children's stories come to life. At Universal's Islands of Adventure you'll experience innovative rides and attractions that challenge all your senses, including The Wizarding World of Harry Potter™; The Amazing Adventures of Spider-Man®, now in high-def 3-D; The Incredible Hulk Coaster®; the Jurassic Park River Adventure®; and The Cat in the Hat™. Go beyond the screen and jump into the action of your favorite films at Universal Studios Florida®. At the world's premier movie and TV based theme park, you'll find an amazing array of rides, shows, movie sets and attractions including the 3-D ride Despicable Me Minion Mayhem, the Hollywood Rip Ride Rockit® multi-sensory coaster, Shrek 4-D, Revenge of the Mummy®, The Simpsons Ride™, MEN IN BLACK™ Alien Attack™, Universal's Superstar Parade, Universal's Cinematic Spectacular–100 Years of Movie Memories nighttime show, and more. Embark on a daring adventure that redefines thrill rides. TRANSFORMERS: The Ride - 3D is an ultra-immersive sensory experience that puts you on the front lines of an intergalactic war between the Autobots and Decepticons. 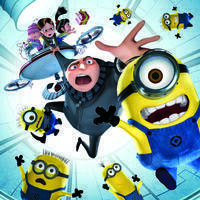 You'll lose sight of the difference between fantasy and reality as ground-breaking high definition 3D film is fused with flight simulation technology on this epic ride. Dance, drink, shop, and see it all in one place-Universal CityWalk. Only here can you walk from some of Orlando's most popular restaurants into some of its hottest clubs, trendiest shops and state-of-the-art theatres. It's anything and everything you want to make your night come alive-Universal CityWalk, the Entertainment Capital of Orlando„ . Blue Man Group has taken their indescribable live celebration of art, technology, and music to a whole new level. Experience the wonder of Blue Man Group with incredible new performances, astounding new music and an all-new stage. It's science, it's laughter, it's that creative urge you feel inside and want to explore. Spend a day at SeaWorld® Orlando and come face-to-face with the ocean's most fascinating marine animals. With more than 30 family-friendly attractions, shows and rides, this admission ticket has something for everyone! Venture into the amazing world of the ocean and its inhabitants as SeaWorld Orlando takes you on an unforgettable journey into the deep blue sea. With several up-close encounters with killer whales, sharks, polar bears and turtles, you'll feel the enthusiasm, energy and excitement of all kinds of marine life. For additional fun, choose from combo ticket options with Busch Gardens and Aquatica. One of the top zoos in North America, Busch Gardens brings you face-to-face with more exotic and endangered animals than any destination outside of Africa, with live shows that take you to the heart of the jungle through music and dance. Discover a colorful village nestled among towering trees, explore a 3-story playland of climbing nets and tunnels, soar above the treetops on a zipline adventure or launch into the sky from inside a 35-foot (10-meter) waterfall. Then, come face-to-face with orangutans and test your strength in a tug-of-war with a Bengal tiger! Don't miss this whimsical, one-of-a-kind waterpark. Float on a river through a world of colorful fish and then race into rolling rapids. Hop on two awesome tube slides and speed through a lively lagoon filled with friendly dolphins. Catch waves in the huge wave pool and soak up some sun or relax in the shade on the sandy beach. See the Itinerary below for a full list of exhibits, rides and attractions. Take a virtual flight to the moon and back at one of Florida's best attractions! On this full-day Kennedy Space Center tour from Orlando, you'll tour the NASA facility and Apollo/Saturn V Center to see rockets and their launch pads, plus visit the Astronaut Hall of Fame and the Shuttle Launch Experience. If you wish, you can upgrade your tour to include lunch with an astronaut or get a Space Pass Plus to include a KSC Up-Close tour of the Vehicle Assembly Building and more. We have lift-off! Your Kennedy Space Center tour begins after an approximate 45-minute drive from Orlando. From the Visitor Complex, view rockets from all eras of space exploration in the Rocket Garden, and see an actual Gemini program capsule on display in Early Space Exploration. Then, walk beneath a massive Saturn V rocket at the Apollo/Saturn V Center, where you can relive Neil Armstrong's first steps on the moon and experience the thunderous rumble of a Saturn V moon rocket lift-off! Continue with two IMAX space movies viewed on five-story screens – Magnificent Desolation: Walking on the Moon 3D and Space Station 3D, which takes you on a virtual trip to the International Space Station. Enjoy other Kennedy Space Center shows and exhibits including a chance to meet an astronaut at the Astronaut Encounter Show. Board a full-size Space Shuttle mock-up and strap in for a virtual launch into space on the Shuttle Launch Experience. Orbit the earth in this awesome simulation, replicating the sights, sounds and feelings of an authentic shuttle launch. Finish your day with a visit to the US Astronaut Hall of Fame, featuring the world's largest collection of personal astronaut mementos, historic spacecraft and hands-on activities. Sit in a mission control console, take a virtual moonwalk, feel the pull of 4Gs in the G-Force Simulator and land the Space Shuttle. If you choose, you can upgrade your tour to dine with an astronaut and enjoy a delicious lunch with a member of NASA's Astronaut Corps. Or, choose Space Pass Plus, which combines all of the above with a guided KSC Up-Close tour of the Vehicle Assembly Building plus NASA Causeway and A/B Camera Stop. Finally, relax aboard the bus as you enjoy return transport to Orlando. With the Universal Orlando 3-Park Unlimited Ticket with Park-to-Park Access, you can come and go as much as you please between two amazing theme parks and one waterpark on all days during at fourteen (14) consecutive calendar day period! Experience the pulse-pounding thrills of Universal's Islands of Adventure®, including The Wizarding World of Harry Potter™, The Amazing Adventures of Spider-Man™ and Jurassic Park River Adventure®. Take a starring role in some of the biggest movies and TV shows ever created at Universal Studios®, home of Shrek 4-D, Revenge of the Mummy® and the Hollywood Rip Ride Rockit® coaster. At Wet 'n Wild® experience more themed, multi-person thrill rides than any other waterpark around. Enjoy the best in restaurants, nightclubs, shopping and movies at Universal CityWalk®. Go beyond the screen and jump into the action of your favorite films at Universal Studios Florida®. At the world's premier movie and TV based theme park, you'll find an amazing array of rides, shows, movie sets and attractions including the 3-D ride Despicable Me Minion Mayhem, the Hollywood Rip Ride Rockit multi-sensory coaster, Shrek 4-D, Revenge of the Mummy, The Simpsons Ride™, MEN IN BLACK™ Alien Attack™, Universal's Superstar Parade, Universal's Cinematic Spectacular–100 Years of Movie Memories nighttime show, and more. Thrills are for sharing! Only Wet ‘n Wild® Orlando gives you more themed, multi-person thrill rides than any other waterpark around. Signature hits like Disco H20™, Brain Wash™, Bubba Tub, The Flyer and more. Now open, the all new Blastaway Beach™, the largest family water play area in Florida. 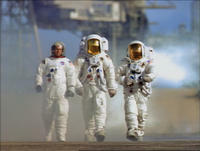 Kennedy Space Center is like an Orlando-style space-travel theme park - only it's real! It's a great day out for the whole family, and only 45 minutes from Orlando. You'll need to plan on spending at least a full day to explore NASA's launch headquarters, located on a huge island wildlife refuge eight times the size of Manhattan. Choose admission to the Kennedy Space Center Visitor Complex, or go for the Space Pass. This includes the Kennedy Space Center tour of NASA's launch headquarters, Shuttle Launch Experience, astronaut encounter, two IMAX films (Space Station 3-D and Magnificent Desolation), all shows and exhibits, and a visit to the U.S. Astronaut Hall of Fame. This pass allows you entrance into the Astronaut Hall of Fame over two consecutive days within a seven day period. Space Pass Plus: Available for a Limited Time with Limited Space! This package gives you everything in the Kennedy Space Center Visitor Complex Admission, plus you can have lunch with an astronaut and take the Kennedy Space Center up-close tour and visit the vehicle assembly building to see where rockets are built (reservations required). The pass can also be used over two consecutive days within a seven day period. Please see below for all attraction descriptions. Starting June 29, don't miss the brand-new Space Shuttle Atlantis exhibit, showcasing the legendary spacecraft, Atlantis. More than 60 interactive experiences highlight the people, passion and patriotism behind NASA's program that launched the Hubble Space Telescope and built the International Space Station, plus you can see what it's like to be a real astronaut! Take the helm at the shuttle cockpit; experience the sensation of floating in space; explore a replica of the ISS; and strap in to the sights, sounds and sensations of a shuttle launch! At Universal Orlando® Resort you'll find two amazing theme parks, non-stop nightlife and more, all in one convenient location. Experience the pulse-pounding thrills of Universal's Islands of Adventure®, including The Wizarding World of Harry Potter™; The Amazing Adventures of Spider-Man®, now in high-def 3-D; and the Jurassic Park River Adventure®. Take a starring role in some of the biggest movies and TV shows ever created at Universal Studios®, home of the 3-D ride Despicable Me Minion Mayhem, Shrek 4-D, Revenge of the Mummy®, Universal's Superstar Parade, Universal's Cinematic Spectacular nighttime show, and the Hollywood Rip Ride Rockit® coaster. And enjoy the best in restaurants, nightclubs, shopping and movies at Universal CityWalk®. It's all at Universal Orlando Resort, where vacation becomes adventure. Take an unforgettable journey through remarkable islands where all your favorite myths, legends, comic books, cartoons and children's stories come to life. At Universal's Islands of Adventure you'll experience innovative rides and attractions that challenge all your senses, including The Wizarding World of Harry Potter™; The Amazing Adventures of Spider-Man, now in high-def 3-D; The Incredible Hulk Coaster®; the Jurassic Park River Adventure; and The Cat in the Hat™. Make your childhood fantasies come true and take a sunrise flight over Orlando in a hot-air balloon! You'll fly over beautiful forests and lakes on this ultimate Orlando experience. Meeting one hour prior to sunrise, you'll travel to your launch site for take-off. Once you are airborne, your pilot will point out the spectacular sights of the Orlando area, from the theme parks to the orange groves, forests and swamps. Your hot-air balloon flight lasts approximately one hour. After your exhilarating flight you'll drink a traditional champagne toast to your memorable experience (non-alcoholic beverages are also available) before heading to the Best Western Lakeside for an all-you-can-eat breakfast buffet. You'll then be presented with a Flight of Ascension certificate by your pilot. Please note: Ballooning is dependent upon favorable weather conditions. Therefore, if conditions are not favorable for a safe flight, the pilot may reschedule or cancel the flight. Please remember to wear closed toed shoes. Experience the spills and thrills of space travel plus the wild beauty of the Everglades on this fun-filled combo day trip from Orlando! Discover Florida's swamplands on a thrilling airboat adventure ride before your visit to the Kennedy Space Center, where you'll have more than six hours to explore multiple exhibits at NASA's launch headquarters. Head by comfortable coach to the Everglades, about 45 minutes outside of Orlando, and discover the diversity of flora and fauna in Florida's amazing wetlands. When you arrive at the park, board your airboat for a thrilling 30-minute ride! As you soar into the miles of protected swamps, marshes and rivers that make up the Central Florida Everglades, your guide will point out native plants, flowers, birds and other wildlife such as the Florida alligators – the Everglades' most formidable inhabitants. Then, take a 20-minute drive by bus to Kennedy Space Center, where you'll have approximately 6.5 hours to explore the Visitor Complex. Your visit includes a tour of NASA's launch headquarters, the Shuttle Launch Experience, two IMAX films (Magnificent Desolation: Walking on the Moon 3D and Space Station 3D), plus a variety of shows and exhibits – including a chance to meet an astronaut at the Astronaut Encounter Show. When you're all spaced out from the Kennedy Space Center, relax with return transport back to Orlando. 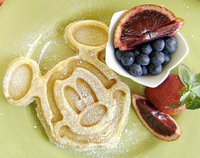 Delight your kids with breakfast with their favorite Disney characters! Travel in style aboard a luxury stretch limousine from your Orlando hotel to Disney's Grand Floridian Resort and Spa, where you and your family will sit down to a wonderful breakfast alongside various Disney characters. This is the best way to interact with Disney characters away from the crowded theme parks, and you'll go home with plenty of photos and autographs! Likely to sell out: Due to the popularity of Disney-themed restaurants, availability is often limited or not available without advance reservations. Book ahead of time to avoid disappointment! Get ready for an unforgettable morning with the whole family! You'll be picked up from your Orlando or Kissimmee hotel and driven in comfort and style aboard a luxury stretch limousine to 1900 Park Fare at Disney's Grand Floridian Resort and Spa. Sit down with your family to a wonderful breakfast, including hot dishes, made-to-order omelets, fruit and more. While you eat, various Disney characters will visit your table for photos and autographs! Your kid's will be absolutely delighted by the appearances of their favorite Disney characters, who are sure to put a smile on everyone's faces. This is the best way to mingle with some of the most popular Disney characters away from the huge crowds typical of the theme parks. You'll spend approximately 3 hours at Disney's Grand Floridian Resort and Spa before hopping back in the limo and heading back to your selected drop-off location. On this tour from Orlando, take a narrated boat cruise on the Crystal River to snorkel and swim with manatees -- the gentle giants of the Florida Everglades. Then, take an exhilarating airboat tour on the Homosassa River and visit Homosassa Springs Wildlife State Park to watch a manatee-feeding session and see other animals including bears, panthers and alligators. You'll enjoy a day out on the water getting to know Florida's local wildlife. Breakfast and lunch are included. Your day starts in Orlando with an all-you-can-eat breakfast. Then, it's off to join a team of manatee experts for a narrated boat cruise on the picturesque Crystal River, home to one of the world's largest populations of endangered West Indian manatees. You'll learn how this large, harmless aquatic mammal is under threat due to loss of habitat. With your provided mask and snorkel, you are encouraged to go for a swim and snorkel with the manatees while under the guidance of certified dive masters! After your cruise, enjoy a picnic-style lunch overlooking this beautiful sanctuary. Your adventure continues in the afternoon with an exhilarating 45-minute airboat tour on the Homosassa River. During your airboat ride, keep your eyes peeled for manatees and dolphins, as well as a host of other wildlife. To end your day, you'll visit Homosassa Springs Wildlife State Park, famous throughout Florida for its efforts in rehabilitating injured animals. You'll see more manatees during an informative and entertaining feeding session with a park ranger. You can also see bears, panthers, alligators and even a hippo as you explore the rest of the park. Afterward, you'll be taken back to Orlando.